I bought a bunch of Gladioli in the supermarket this week. The trumpet flowers open out from the tall green stems. The gladiolii flowers come in many shades, purple, pink, red, yellow or white. These flowers bring back memories of attending Church as a child and the routine of Sunday morning in our home on the farm. In the country where I grew up, the community gathered at the church on the hill. It was within walking distance from our home. Dad and two of the family would go to first mass at eight o’clock. Seasonal flowers decorated the Church altar. 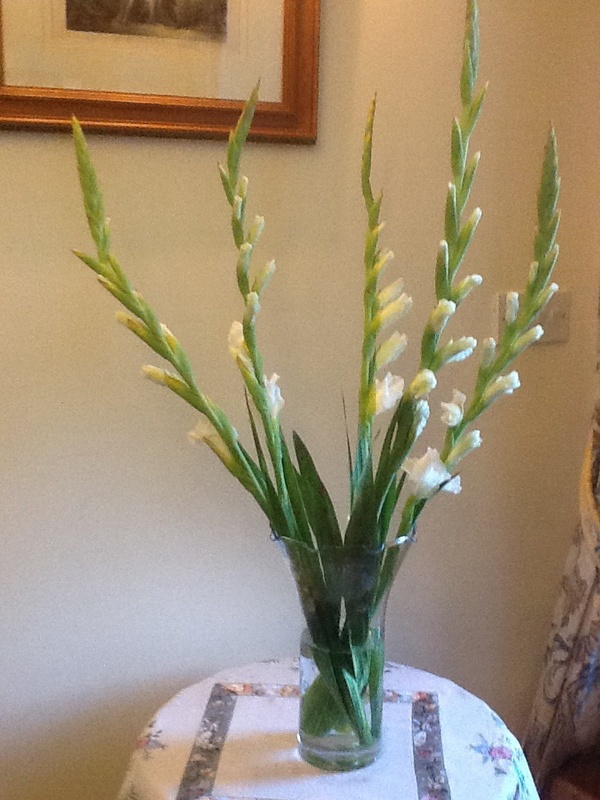 The gladioli stood out for me as the most beautiful flowers I had ever seen. Their stems reached up to the heavens and the flowers opened up into trumpets. I imagined they were brought from some exotic place far away. I never saw such flowers grow ing in the local gardens. I remembered the smell of the incense and the singing of the choir at Church. Words were sung to someone beyond my world. My heart was lifted up above my circumstances. People dressed in their best clothes. Families sat together in pews. Going to Church on Sunday for me was very special. Those holy, innocent days going to Church as a child are long gone. I was oblivious to the big world beyond the church and the farm. I imagined the Gladioli came from out there somewhere? Dad would stand and talk to neighbours after mass and get a catch up on the local news. Mum would make fried, fresh, farm eggs and bacon with home made soda bread for dad’s return. As we smelt the bacon we would turn up for breakfast at different times. Sundays were restful. No farmwork or school to go to. No last minute rush to catch the school bus at the bottom of the lane. The rest of the family would walk or get a ride in the car to second mass at eleven o’clock. Whoever went to first mass would prepare the Sunday dinner for us all. Dad would sit by the fire and read the newspaper. It was his day off. We usually had a stew. I loved the smell of it as it cooked on the stove and we waited for the others to return. After dinner we would listen to Family Favourites on the Radio. I remember songs being played that were sung by Burl Ives, The Ugly Bug Ball, The Little White Duck or Rudolfh the Red Nose Reindeer. I never heard about the Sabbath Day then. I now know that God intended that man should rest from his labour one day of the week. Our family did have that day off. God intended the Sabbath for man to rest. If God needed refreshed after working all week, I think I will take his example. He does not want to harm us, it is for our benefit to have a day off, in this world where so many other things take up our thinking, strength and money.